Below is something I wrote some time ago. I still agree with most of its sentiments. I was in a kind of reverie when I realized the direction that Pythagoras‘ thought was taking me. According to Iamblichus of Chalcis, Pythagoras once said that “number is the ruler of forms and ideas and the cause of gods and daemons.” His statement that a stone was frozen music resonated with me. Below is a scan of my original notes. Excuse some of its exuberance. Below is an entry from “The Herder Symbol Dictionary” on what the humble honey bee signifies. Then follows an article about the possible extinction of the honey bee. I believe that events in life may also be symbolic of portending events. OK, I’m talking about omens and signs. Now, if honey bees face extinction, what does it mean for us? It is an insect that primarily symbolizes diligence, social organization, and cleanliness (since it avoids everything dirty and lives from the fragrance of flowers). In Chaldea and imperial France, the bee was a regal symbol (for a long time the queen bee was thought to be a king); it is possible that the fleur-de-lis of the House of Bourbon developed from the bee symbol. In Egypt the bee and the sun were associated, and the bee was considered to be a symbol of the soul. In Greece it was considered a priestly creature (the priestesses of Eleusis and Ephesus were called bees, probably with reference to the virginity of the worker bees). The bee, which appears to die in winter and return in spring, is sometimes a symbol of death and rebirth (e.g., of Persephone, Christ). Because of its untiring work, the bee is a Christian symbol of hope. For Bernard of Clairvaux the bee signifies the Holy Ghost. The bee is a Christ symbol as well. Its HONEY represents Christ’s gentleness and compassion; its stinger symbolizes Christ as judge of the world. Since according to ancient tradition bees do not hatch their own young but collect them from blossoms, bees were symbols in the Middle Ages of the Immaculate Conception. The bee is also symbolic of honey-sweet eloquence, intelligence, and poetry. The rush and the bee, hieroglyphs from the royal title signifying King of Upper and Lower Egypt. Albert Einstein once predicted that if bees were to disappear, man would follow only a few years later. That hypothesis could soon be put to the test, as a mysterious condition that has wiped half of the honey bee population the United States over the last 35 years appears to be repeating itself in Europe. Experts are at a loss to explain the fall in honey bee populations in America, with fears of that a new disease, the effects of pollution or the increased use of pesticides could be to blame for “colony collapse disorder”. From 1971 to 2006 approximately one half of the US honey bee colonies have vanished. Now in Spain, hundreds of thousands of colonies have been lost and beekeepers in northern Croatia estimated that five million bees had died in just 48 hours this week. In Poland, the Swietokrzyskie beekeeper association has estimated that up to 40 per cent of bees were wiped out last year. Greece, Switzerland, Italy and Portugal have also reported heavy losses. The depopulation of bees could have a huge impact on the environment, which is reliant on the insects for pollination. If taken to the extreme, crops, fodder – and therefore livestock – could die off if there are no pollinating insects left. In France in 2004, the government banned the pesticide Fipronil after beekeepers in the south-west blamed it for huge losses of hives. The manufacturers denied their products were harmful to bees. Polish beekeeper associations claimed that the losses in their country could be connected to cheap sugar substitutes used in mass honey production. However, experts at the largest honey bee health company in the world, Vita, based in Basingstoke, said the cause was still unknown, and therefore neither was the cure. The company’s technical director, Dr Max Watkins, said: “If it turns out to be a disease we will probably find a cure. But if it turns out to be something different, like environmental pollution, then I do not know what can be done. Initial studies of dying colonies in America revealed a large number of disease organisms present, with no one disease being identified as the culprit, van Engelsdorp added. German bee expert Professor Joergen Tautz from Wurzburg University said: “Bees are vital to bio diversity. There are 130,000 plants for example for which bees are essential to pollination, from melons to pumpkins, raspberries and all kind of fruit trees – as well as animal fodder – like clover. 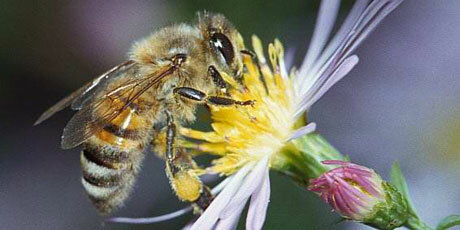 “Bees are more important than poultry in terms of human nutrition. Bees from one hive can visit a million flowers within a 400 square kilometre area in just one day. To talk about the esoteric is in many ways a blasphemy – the very act of pretending knowledge of the divine is bad faith. The intuitive finds its place in an inner hierarchy of will. I do feel sometimes that this kind of will should be capitalised – Will. When I think of the intuitive I think of the instinctive intelligence of a new born baby that turns its head and opens its mouth and begins to suckle on the mother’s breast. This is real intuitive intelligence – a balance between what is needed, what is possible, and what is beautiful. Today many in our Western “developed” world have lost the intuitive ability, to use one’s instinctive intelligence to create order in the world. The intuitive, I feel, is the circumference of the essential. Esoteric to me means HIDDEN – nothing more and nothing less. The esoteric partakes of an energy rather than static conceptualisation. The esoteric current flows through all and everything – yes, there is the esoteric side of a stone and the esoteric side of rationality and a smile. The only way to convey the esoteric from one human to another is through presence or the ingestion of energetic – wisdom – texts. These texts are living organic IDEAS that act like yeast in the mind. There are certain Ideas which are larger than mere conceptualisation and these Ideas, I feel, partake of a life, they are angelic life forms. The purpose of these living texts / Ideas is not to stuff one’s mind with extra information but rather to change its constitution so that it can become receptive to the esoteric. This is an aspect of alchemy. The discernment of the intuitive / esoteric is a function of that same hidden energy. These sacred esoteric texts serve as long koans, and if approached in an appropriate manner may open a mind to the hidden forces. The idea of text must also be enlarged in regard to the esoteric. In this context the Temple of Luxor in Egypt is a text behaving in the above manner (see R A Schwaller de Lubicz ), as are the various revelations of the world’s religions, and various dances, rituals and art. Gurdjieff coined a word for these “texts” – legominisms. To someone who is imbued with an esoteric vision, the whole of life is one big hieroglyph waiting to be read and understood. Astrology from this perspective, is a form of life “language” and algebra. Dane Rudhyar called Astrology, the algebra of life. I like this, but I also see Astrology as a language with its own syntax and grammar. I believe that the ability to discern the esoteric from the exoteric has something to do with one’s will. This something cannot arise without assistance from the hidden parts of one’s nature. I don’t seek the esoteric, the esoteric seeks me. Mucking around with Photoshop I found the Posteriser, well, technically “poster edges”. It makes posters of photos and emphasises the edges of the picture’s various contours. It’s incredible to see some of my photos in a new light. I posterised some photos I put up on my old Photojournal website in 2002 and the whole process changes the picture in an amazing way. This old geocities website no longer exists. So who said that websites are eternal? When I took these pictures I used a cheap “instamatic” camera without a zooms lens. My instamatic camera used film and it was very expensive to develop the large number of rolls of film I had when I returned to Australia. I then scanned the photos and used Photoshop to enhance and edit as needed. Today I use a small digital camera, not only is it far cheaper to take and see your photos, but also with the large memory disks available you don’t have to worry about carrying rolls of film. So, 2000 seems like another age when it comes to photography! The following pictures are from the above website. I will put up more “posterised” photos as I complete them here. Just click on the pictures below to see an enlarged version. Bethlehem, Israel – Jesus’ birth spot according to tradition. Mount Athos, Greece – known as the Holy Mountain by Orthodox Christians. Olympia, Greece – birthplace of the Olympic Games. Palmyra, Syria – some of the best preserved Roman ruins in the world are here about 200 kms from Baghdad, Iraq. Aroutsas St Athens, just below the Acropolis in Athens. Patmos, Greece – entrance to cave where St John wrote the Book of Revelations. Petra, Jordan – Indiana Jones country! Seljuk, Turkey (near Ephasus) engraving close to St John’s grave. Palmyra, Syria – Stavros on a camel. Mount Sinai, Egypt – view from the top of Mt Sinai. Goreme, Turkey – entrance to a cave house. Diakopto, Greece – a few minutes walk from my father’s house. Goreme, Turkey – cave house. Goreme, Turkey – “Star Wars” Luke Skywalker land of his birth. Goreme, Turkey – tunnel between cave houses. Goreme, Turkey – view from inside a cave house. George I Gurdjieff (1866? – 1949) was a Greek – Armenian who introduced the Fourth Way to the Western world. His Greek name is Georgiades which has been “Russified” to Gurdjieff by which he is more commonly known. Gurdjieff’s ideas have touched me to the core and I can say that of all the spiritual teachings available to us today, that his resonates in a very deep way with my own needs and search. ~ Fix your attention in yourself, be conscious at every instant of what you think, feel, want and do. ~ Always finish what you started. ~ Do your best with whatever it is you are doing. ~ Do not chain yourself to anything that will destroy you on the long haul. ~ Develop your generosity without witnesses. ~ Treat every person as if they were a close relative. ~ Order what you have messed up. ~ Learn to receive, thank every gift. ~ Cease to autodefine yourself. ~ Do not lie or steal, if you do, you lie to and steal from yourself. ~ Help your neighbor without making him dependent. ~ Do not wish to be imitated. ~ Make work plans and carry them out. ~ Do not take too much space. ~ Do not make unnecessary noises or gestures. ~ If you don’t have it, imitate faith. ~ Do not let yourself be impressed by strong personalities. ~ Do not take possession of anything or anyone. ~ Eat and sleep what’s strictly necessary. ~ Do not speak of your personal problems. ~ Do not emit judgments or criticisms when you do not know most of the facts. ~ Do not establish useless friendships. ~ Do not follow fashions. ~ Do not sell yourself. ~ Respect the contracts you have signed. ~ Do not envy the goods or successes of your neighbor. ~ Say only what’s necessary. ~ Do not think of the benefits that your actions will bring you. ~ In a discussion put yourself in the place of the other. ~ Admit that someone might supersede you. ~ Do not eliminate, transform. ~ Conquer your fears, each one of them is a desire that camouflages itself. ~ Help the other help himself. 39. Vence tus antipatí­as y acércate a las personas que deseas rechazar. ~ Conquer your antipathies and get close to the persons you wish to reject. ~ Do not act out of a reaction to what good or bad they say about you. ~ Transform your pride in dignity. ~ Transform your anger into creativity. ~ Transform your greed into respect for beauty. ~ Transform your envy into admiration for the values of the other. ~ Transform your hate into charity. ~ Do not praise nor insult yourself. ~ Treat what doesn’t belong to you as if it did. ~ Do not give orders just for the pleasure of being obeyed. ~ Pay for the services that you are given. ~ Do not make propaganda of your doings or ideas. ~ Do not try to awaken in others emotions towards you like compassion, admiration, sympathy or complicity. ~ Do not try to distinguish yourself by your appearance. ~ Never contradict, just be silent. ~ Do not contract debts, acquire and pay right away. ~ If you offend someone, ask for forgiveness. ~ If you have offended him publicly, apologize in public. ~ If you realize you have said something wrong, do not insist out of pride on that mistake, and desist immediately of your intentions. ~ Do not defend your old ideas just because of the fact that it was you who uttered them. ~ Do not keep useless objects. ~ Do not adorn yourself with others’ ideas. ~ Do not take Pictures of you next to famous characters. ~ Do not explain yourself to anyone, be your own Judge. ~ Never define yourself by what you posses. ~ Never speak of yourself without granting yourself the possibility of changing. ~ Accept that nothing is yours. ~ When asked your opinion about something or someone, only say their qualities. ~ When you are sick, instead of hating that illness consider it your teacher. ~ Do not look hintedly, look straight. ~ Do not forget your dead, but give them a limited place that impedes them from invading all your life. ~ In the place you live consecrate always a place for the sacred. ~ When you perform a service do not highlight your efforts. ~ If you decide to work for others, do it with pleasure. ~ If you doubt between doing and not doing, take a risk and do. ~ Don’t try to be everything for your couple; admit he/she may search for in others what you cannot give him/her. 77.Cuando alguien tenga su público, no acudas para contradecirlo y robarle la audiencia. ~ When someone has their public, do not approach to contradict or steal the audience. ~ Live off of money earned by yourself. ~ Do not boast about love affairs. ~ Do not vainglory yourself of your weaknesses. ~ Never visit someone just to fill your time. ~ Obtain in order to share. 83. Si estás meditando y llega un diablo, pon ese diablo a meditar. ~ If you are meditating and a devil arrives, put that devil to meditate. You are currently browsing the Journeys and Star Gazing blog archives for March, 2009.